MCR Safety has designed a broad line of Hi-Visibility Products that will allow you to find the right product for your application. The BP2CL3O 2-in-1 insulated bomber jacket meets ANSI Class 3 standards and will help keep you safe when Hi-Visibility is an important factor. 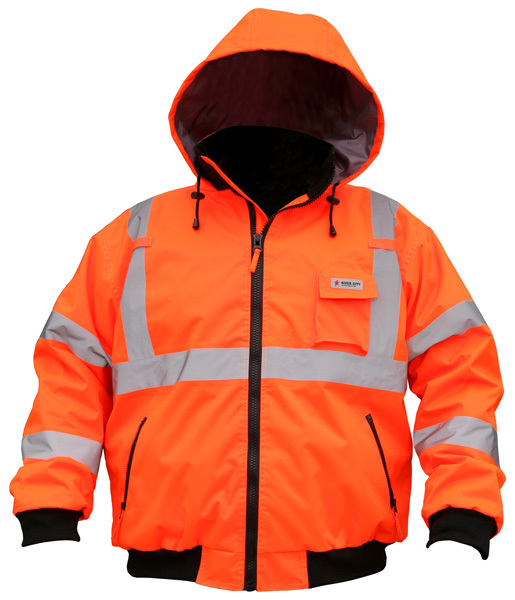 This jacket features a fluorescent orange polyurethane / cotton polyester material with 2” silver reflective stripes for visibility in low light applications. It features a zip-out fleece liner that can easily be removed when temperatures warm up, and zipped back in place as cold weather approaches. Other features include a front zipper closure, 2 outer zippered slant pockets, 1 outer cell phone pocket, 2 mic-tabs and an attached hide away drawstring hood. Elastic at the waist and wrists help ensure a warm comfortable fit. Waterproof.